Dawabsha family survivors aren’t afforded the same rights as Jews. Israel’s Property Tax and Compensation Fund Law (1961) provides monetary payments for property damage caused by terrorism. Its Victims of Hostile Action Law (1970) provides compensation for bodily injuries suffered from terrorist attacks – as well as payments to family members of deceased victims. Palestinians don’t qualify, only Jews, another example of a racist state, ignoring the rights of all people it’s obligated to protect. Riham Dawabsha and her four-year-old son Ahmad are the remaining family survivors – both in intensive care precariously clinging to life with severe third-degree burns covering most of their bodies. They’re physically unable to seek redress. They may not survive their ordeal. Yet Israeli law requires Palestinians victims of terrorism to appeal to a Defense Ministry committee – hostile to their interests – for compensation unlikely to be received. Palestinian MK Yousef Jabareen called Israel’s system “absurd” and discriminatory. “Victims of nationalistic action must be eligible for compensation, and it doesn’t matter if they’re Arab or Jewish,” he said. He wants Attorney General Yehuda Weinstein to assure Palestinian terrorism victims are treated the same as Jews. Firebombing the Dawbsha home on July 31 sparked world outrage. Israeli officials called the attack “terrorism.” Riham and Ahmad deserve no less compensation and overall redress than Jews. 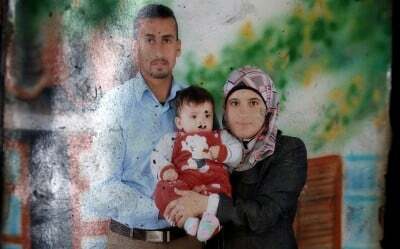 Nothing can replace the loss of 18-month-old Ali and Riham’s husband Saad. No amount of redress can reunite all family members in peace and security. Nothing can change what happened that fateful day. Israeli security forces routinely conspire with settler terrorists against defenseless Palestinian victims – letting them rampage freely, commit near daily acts of violence and vandalism with virtual impunity. Police states operate this way – including whitewashing their worst high crimes. Israeli forces last summer alone mass murdered over 2,200 Gazans, injured over 11,000, and turned large parts of the Strip to rubble – still not rebuilt because construction materials and other vital supplies are blocked from entering except in too small amounts to matter. While horrendous crimes of war and against humanity were being committed, Israeli security forces viciously assaulted Arab citizens peacefully protesting ongoing carnage. Jewish activists joined them in solidarity. Israeli authorities “adopted a ‘zero tolerance’ approach to citizens opposing” aggressive war against 1.8 million Gazans trapped under siege, said Adalah. The entire Strip was turned into a free-fire zone. No safe havens existed – not private homes, mosques, refugee camps, schools, or UN facilities to keep civilians out of harm’s way. Israeli Arabs and Jews were denied their free expression right to protest. Police brutality confronted them. Serious violations of Israel’s Criminal Procedure Code and other statutes were committed. “The police exhibited a complete disregard for the principles and criteria that apply to its authority for preventing and dispersing demonstrations, which are stipulated in rulings of the Israeli Supreme Court as well as Guideline 3.1200 issued by the Attorney General regarding the right to protest,” said Adalah. After one month of conflict, over 1,500 protesters were violently arrested – mostly Arabs, some requiring hospitalization. Children were brutalized like adults. Police viciously attacked every peaceful demonstration held throughout 51 days of conflict. Courts rubber-stamped their actions – ordering lengthy detentions for people exercising their legitimate rights peacefully, committing no crimes. Judges showed overt sympathy with aggressive war murdering Palestinians in cold blood. They were intolerant of peaceful protesters. Nearly 350 criminal indictments were filed on bogus charges of violating public peace, congregating unlawfully, acting unruly in public, assaulting police, inciting racism or committing violent acts. Legitimate anti-war activism was criminalized – Israeli Arab citizens especially singled out for harsh treatment. Arab workers were fired for opposing government policies on Facebook and other social networking sites. Students and faculty members were disciplined the same way. (T)he incidents described in this report indicate that a public atmosphere of intolerance, racism, persecution and incitement characterized the most recent war. Social networking sites became a frontier for targeting individuals opposed to the war on Gaza, with employees harassed and followed by co-workers and sometimes fired for online posts or statements. The situation was just as severe for students and faculty members, whose political activities were closely monitored by universities and who faced disciplinary measures for speaking out against the military operation. “Altogether, the widespread phenomenon of Israel’s restrictions on the freedom of expression of Palestinians citizens reached a point to which that freedom was almost rendered non-existent, all with the aim of silencing opposition against a devastating war” – premeditated lawless aggression by any standard.